The work trajectory of Atsuko Nakamura is articulated by sculpture although it also covers video and engraving. 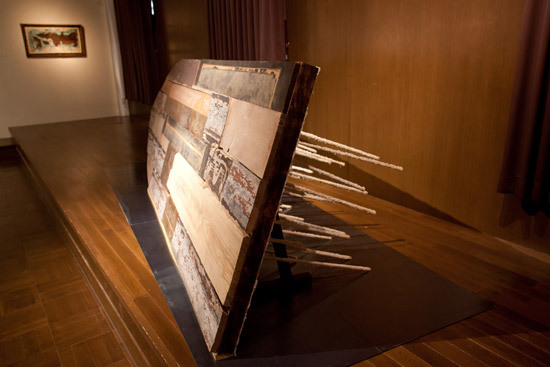 Her artistic itinerary has contrasting influences derived from her early experiences in a family devoted to traditional techniques in a preeminently natural environment and from her later studies in Architecture. In her sculptures, Nakamura brings together the technical skills learnt at the School of Architecture and the traditional art of Ikebana as well as a deep spirituality. She calls herself “Miko[i]” in a parallelism with the idea that Joseph Beuys had of the artist as a shaman. Her reflection upon the present denial of nature through the design of modern urban and industrial environments clashes with the traditional respect for nature in Japanese culture as it is transmitted from generation to generation through tales and religious practices. 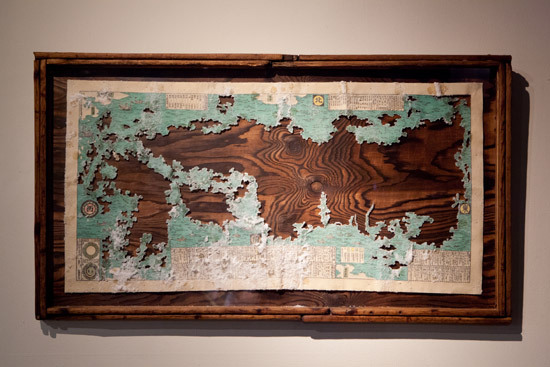 The perception of nature in different cultures and religions has had a clear impact in her projects around the world. 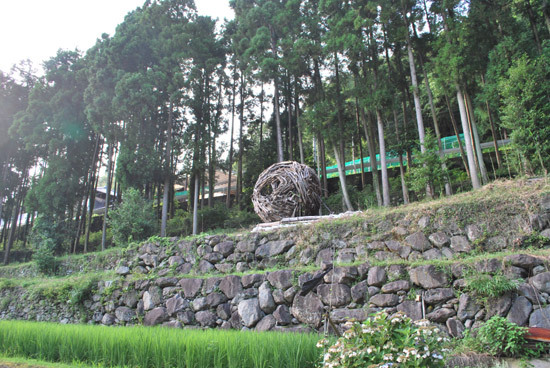 At the time of this interview Nakamura is working in a project at Shodo Island in the Inland Sea of Japan where she is making a site-specific sculpture in the open air called “The Seed of the Earth”. This work is part of the group exhibition at the “Nakayama Natural Museum” that takes place every summer since 2013 in this tiny island. In spite of its name the exhibition area is outdoors and it arises from a programme of environment-related activities developed by the elders of the Nakayama district. You studied architecture, but at some point you made a transition to art. How did it happen? On one side, as I was studying the career I found a contradiction: human beings cannot survive without nature, but the urbanization always destroys or pushes out natural environment to achieve a clean and convenient lifestyle. Particularly in Japan, in old times, people had a fear, awe, appreciation towards nature, but such a culture is fading away in these days. I thought this was an important notion, and I decided to investigate the meaning of nature and life in modern times rather than architecture, that actually is designing for someone in particular. On the other side, my architectural design often got the highest score of the class. Thus, in my third year I started to create installations at Kimio Tsuchiya unit (an sculptor who teaches at the School of Architecture). I was lucky to see your first solo exhibition in 2011 at La Caja Blanca gallery in Spain where you made salt sculptures and driftwood installations. Could you tell me what has been your evolution as an artist in the last four years? My persistent theme about the relationship between urban and nature, and my basic approach to make an artwork haven’t changed since my time as a student. However, I think that my recent work involves theatrical aspects. I want to give viewers a kind of experience, a feeling of something invisible, like a metaphysical existence. Let’s talk about the process in your driftwood sculptures. The selection of the spot and the gathering of sticks and branches, are they part of the creative process? When you build the sculpture, does it come spontaneously or do you have a clear idea of what you are going to do? Normally, I plan the form of sculpture beforehand, but through the collecting process and the feeling I get from the site, I sometimes change the plan to embed the work into the context of the site or local history. I often spend a lot of time looking for the place where I can collect driftwood such as searching information from the Internet, visiting the site and asking the locals. The place is often near the sea or a river, and I usually get help from my friends to collect wood. 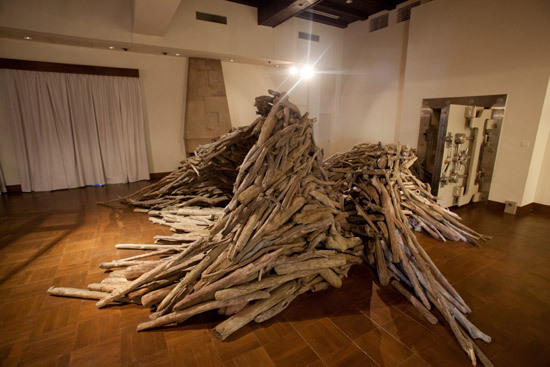 Through this process I get to know the background or environment where the material comes from, and I also learn other cultural aspects such as the different meaning of driftwood in countries like UK and Japan. This affects my concept and output. Particularly, in the present project in Shodo Island where I am working now, I have collected wood with local people. They were so happy to be involved in the art project that I felt the possibility that “collecting” can be a way of involving the community in the artwork. You have studied Ikebana during three years. Do you apply your knowledge in these constructions? I am using a mixture of techniques taken from architecture and Ikebana. In first place I always make an architectural model of the site or the gallery space, then I start to think about the form, material, and size of the sculpture. While I am constructing the sculpture, I often use Ikebana techniques such as looking at each driftwood carefully from 360° and apply the unique shape to the whole shape of the sculpture. In this process, I sometimes find a more unique shape rather than my first plan. When this happens, I change the plan. This kind of dialogue with material and driftwood drives me to create a more interesting form. I like the philosophy of Ikebana, it implies a responsibility to express the life of the flowers who had lost it because people cut the stems to arrange bouquets. I think driftwood is also made of dead branches and I have always wanted to express its life, energy or movement in my work. You also have used salt to make sculptures. Do you have a specific technique? I have been using salt as a material since 2011. I used powder salt in my work ‘A Letter to my Grandfather’ for the first time following the interpretation of the body that comes from Christianity. Then, I introduced salt crystal in my works for the first time in my exhibition “The Pulsating Earth” in Spain. The method of making salt crystal is like a chemical experiment, but how do I make crystal is secret, after many experiments I have the best formula, sorry! Salt is very interesting because it has many meanings and approaches. For example, you can find it in the invisible border between life and death because salt is a necessary substance for human body but an excess of it would kill it. From a spiritual point of view, salt is a purifying element in different cultures. An aspect that draws the attention in some of your sculptures is the use of books not only as objects but also quotations. What is the role of literature and poetry in your work? That’s an interesting question. Well, I think I want to involve something real. I am not interested in making artworks that impose only my feelings or my taste. My work aims to be an interaction between my subjective point of view and the real. I aspire to get through to viewers and throw a question such as ‘I am thinking like this, but how do you think about it?’, introducing something real so that the viewer can be more easily involved into my work. In this sense, my previous research and the video works contribute to this part of reality. Atsuko Nakamura from 1899 on Vimeo. [i] “Miko” is a priestress or a shrine maiden in a Japanese Shinto shrine that had a shaman role in old times.